Listen: I love me an awards show. Don't get me wrong. And while many are outraged at the fact that the now iconic horror film Get Out was nominated for not a drama at the very least, but a comedy (??? ), the truth is obvious.... There's no category for the horror genre, as you noticed! Guillermo del Toro. A gothic horror film. But also a romance. A fantasy. Wes Craven's "Scream" films -- we're sure you even noticed that those movies have their healthy dose of comedy! There's a reason for that. Those themes actually do extremely well when merged with the horror "genre" as it were, and directors like Jordan Peele probably saw that a mile away. Now I'd go as far to say that no one can truly classify GET OUT as a "drama." At least fully. Any creative masterpiece has all sorts of themes; which one's more prevalent? That tends to make the decision on what actually makes a horror film, a romantic comedy, a drama, slapstick, what have you. 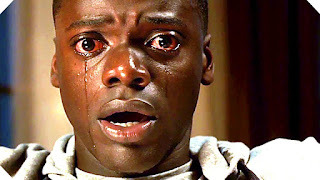 Without a doubt, GET OUT may seem more like a comedy given the themes it presents interlaced with everything on the surface, which is undoubtedly a sense of horror, suspense, paranoia, and all the other goodies coming with it. So don't knock the nomination, man! Definitely take it for what it is. Which is why you often don't see that "genre" at all standing on its own. Not anyone's fault, really. However, you have to remember: there are a lot of bad apples out there, and a market of horror plagued by the release of B-movies, camp, and raunchiness doesn't help much in terms of quality (still love that stuff, though). The gems of the horror industry, though, are indeed out there. And the one thing you have to remember is that while those gems may not be recognized as "horror," the theme, the feel, the style? That's something no award, no critic, no director can ever change.